Speed comparisons between Macintosh G5 compared with Dell Precision Workstation Windows PC. Testing computer performance and benchmarking speed comparisons between Macintosh G5 dual-processor compared with Dell Precision Workstation Windows PC using Adobe Photoshop CS and version 7 too. FLAAR personnel testing the PC DELL equipment. Professor Nicholas Hellmuth at the FLAAR digital imaging facility has organized a comprehensive speed comparison testing and benchmarking of performance of Adobe Photoshop. Brent Cavanaugh has put together the benchmarking suite together with BGSU graduate student in computer sciences, Roshita Mukhia. They are using industry standardized testing procedures. The difference between this and other tests is that both FLAAR and BGSU are independent, neutral and use both Mac and PC within their facilities. Although the PC equipment is provided by Dell, the testing personnel are not paid by Dell, or Apple, but by the University (no money is received from any computer company for these evaluations). Results so far suggest that the Dell Precision Workstations do quite well against the 64-bit Mac G5. The Macintosh G5 is equipped with dual processors and a full 8 GB of RAM. Tests last month showed that the Dell Precision Workstations whipped a dual processor Mac G4 in virtually all tests. Tests are on-going since we are evaluating both Adobe Photoshop version 7 and Adobe Photoshop CS (which has not yet arrived). So if you wish to learn the truth about whether the Mac G5 can handle Adobe Photoshop files better than Dell, you might want to obtain the FLAAR reports on the testing in the BGSU lab. Adobe CS, Creative Suite, just arrived this week. We are now adding an entire chapter to the benchmarking of the Mac G5 and the Dell Precision Workstations based on the Photoshop CS version. Dr Hellmuth is beta tester for BetterLight large format tri-linear scanning back cameras. He went out and shot some special files for the test. This BetterLight digital camera has 48 megapixels in stationary mode; in rotating panorama mode Nicholas was able to acquire a 921.5 MB file for a single photograph. Other photos were 628 MB. The minimum shot is 137 MB for a single picture. 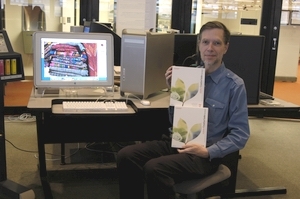 So if the Mac G5 is really the planet's fastest computer, as Steve Jobs so loudly and repeatedly claimed, Professor Hellmuth has the digital imaging files to find out. If a 32-bit Dell computer can hold its own, just calculate what the next generation can do. And calculate what the AMD processor or future 64-bit Intel processors will do. But we will admit, the Apple Macintosh G5 wins the design award. If the sides were scratchproof transparent it would be the ultimate office discussion piece. FLAAR also evaluate digital imaging hardware and software, especially RIP software for wide format inkjet printers. Overall this university research center is the largest independent testing facility of its kind in the US . Over 1000 pages are on the Internet ( www.FLAAR.org ) and an additional 1200 pages are available in more than 80 titles in Adobe PDF format on www.wide-format-printers.NET . First posted Dec. 8, 2003.